At College FundLandscaping our design process is simple. First, we listen closely to our client's desires, needs, personal landscaping tastes, maintenance preferences, and wishes during an in-person visit. During this visit, we complete an assessment of the property where we determine sunlight variances throughout the property, soil health and quality, and any areas with special needs such as areas with erosion. 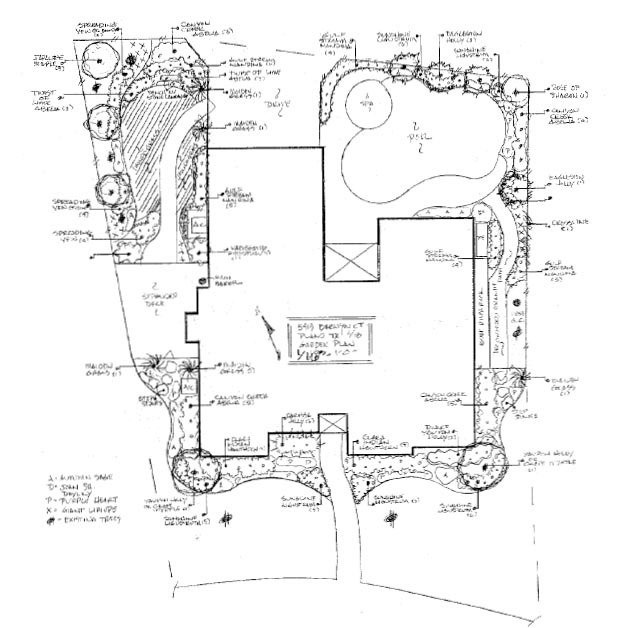 Next, we will complete a detailed drawing of a landscape design plan architected to the fullest detail.We do charge $250 for a front or back yard design ($500 for full designs front and back). The cost of the design is rebated upon the installation; therefore, the design is free if we complete the install. In order to complete a scale design, we will need a copy of your home survey. 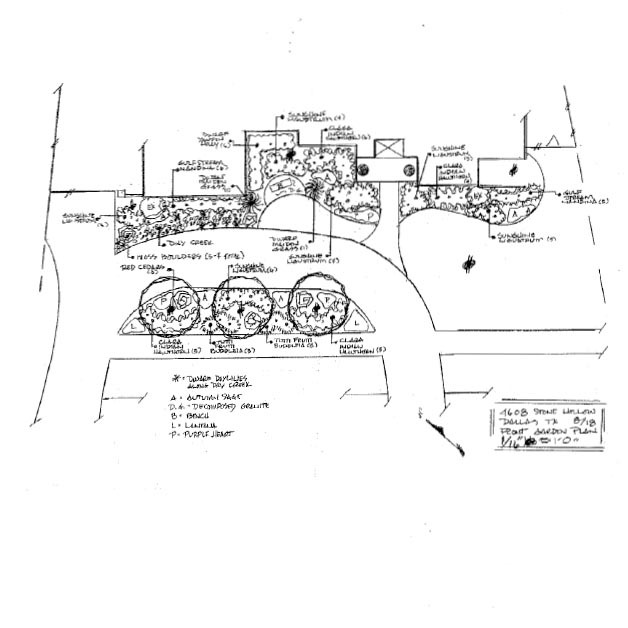 This will allow our landscape architect to properly fit the design to the measurements of your home and choose the rightsize and type of plants for your space. We strongly believe in the planning process. Over the past 20years, we have learned the extra time spent on the design process allows us to make sure we have addressed your wants and desires properly. As we always say, we can change things on paper free and easy but changes after installation are difficult and expensive. We want to make sure we are meeting your expectations and desires. The planning process ensures this occurs. First, our crews will remove any unwanted plants we are not including in the new landscape. We normally recommend removing all old shrubs. It is difficult to achieve a balanced look when some mature plants are kept. The size differences between mature and new plants simply are difficult to balance. There are exceptions to this rule, like mature hedgerows, ornamental trees like yaupon hollies, crape myrtles, vitex, etc. Most of the time a blank canvas is the best pallet to work from. This will all be determined during the design process. Thirdly, we will stage the plants. Staging simply means setting the plants in the planned locations without planting them. This step ensures the “paper design” matches the real-world applications. Some times after staging we may shift a plant or two around to make sure the intended goal is achieved. Next, our expert landscape installation crew will install the plants, mulch the beds, and check irrigation. The irrigation requirement scan vary significantly from home to home. Some of the older homes will require major irrigation adjustments such as new zones. Other homes might simply need a few heads relocated to outside the expanded flower beds. Many customers are upgrading to drip irrigation in their landscape in beds as well. One thing to keep in mind is always important to have dedicated flower bed zones vs turf zones. Shrubs and turf require different amounts of water. Many older irrigation systems do not have these separated. If needed, we will redesign the system to ensure the proper water is applied to the proper areas. Another important aspect we determine during the design process. We do provide a 90-day warranty on all our new plants and one-year warranty on new tree installations. If something looks abnormal, contact us. We will be glad to take a look. After 20 years of installing new residential landscapes in Plano and Collin county, we have found most of the problems with new landscape installs are due to over watering. We only use low maintenance, native plants that will last in the frequent drought years experienced in North Texas. If you want palm trees and other exotic type plants, we are not the right fit for you. We strongly believe in achieving success through proper plant selection. A typical residential front or backyard new landscape installation in Collin County ranges from $3500- $10000. For more details on the costs click here (add hyper link to vlog of how much does a new home landscape cost page). If you have any questions regarding new landscape installation in Plano, Allen, Frisco, McKinney, Murphy, or north Dallas please contact us and we will be glad to help.